Life is, for me, a balancing act between the things I love that improve my soul, and the things I love that…don’t. Here’s some balance for you today, in case you need to tip the scales one way (or, of course, the other). I am absolutely in love with this MTV show. I was reeled in last weekend when I decided to stay home on a Saturday afternoon for once and stumbled across the Season 1 marathon. This pseudo-reality/semi-scripted show is about the life of Liz as she fumbles through her senior year of high school and into art school and life in New York City. Her awkward friends and dyed red-headedness have all the endearing charm and angstiness of “My So-Called Life” for a different generation. It might not be as topical, but it’s certainly as addicting and just as close to the heart of 18-year-old friendships and almost-relationships. Season Two started Tuesday on MTV and follows Liz as she starts art school at Pratt, digs through dumpsters for found-art assignments, and sits in the hallway of her dorm waiting for her room-mate to open the door. Check it out, but don’t tell anyone. If this book didn’t get you with its title, it’ll get you in the first few pages where an unamed narrator describes fuku, the curse of doom that the people of the Dominican Republic, especially the main character Oscar, fear and do nearly anything to avoid. The story follows the massively overweight social outcast, Oscar, who has two friends, a love for fantasy fic, and a family full of fuku fear. 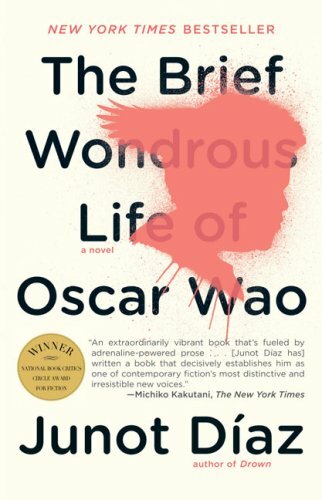 It’s gloriously postmodern ( there are books with no words, lost cures to the curse), has the feel of a work of magical realism, and follows Oscar on what turns out to be a kind of surprising epic hero’s journey. Infused with untranslated Spanish language and the twisty paths of his family’s past, I made myself slow down while I read to make it last longer. It’s complicated, readable, and beautifully, cleverly, windingly written. And you will love Oscar. Card catalogue entry: Junot Diaz, author. I really loved that book and I also liked Diaz’s short stories, a form I usually detest. Thanks, Hillary, I’ll check those out! I forgot about your Spanish-language love. He is right up your alley, isn’t he?